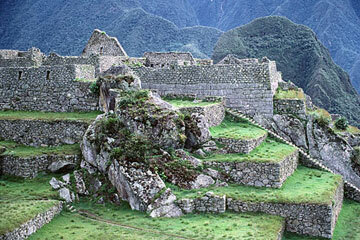 When Hiram Bingham discovered Machu Picchu in 1911, he revealed an untouched portion of the Incan civilization. Machu Picchu, pronounced MAH-choo PEEK-choo, is located approximately 50 miles northwest of the Incan capital Cusco, on a small remote mountain top overlooking the Urubamba Valley. 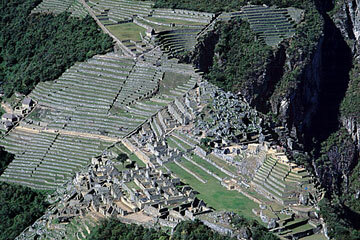 Macho Picchu is divided into three sections, an agricultural section, a religious section and an urban section. The urban section, also called the Popular section, is where the common workers and their families were housed. The Religious Section would have been where the priests and higher ranking people resided. While the amount of land designated for agricultural use could sustain the 4 times the residences, it is firmly believed the agricultural land could not sustain the entire civilization, rather a sacred group, or retreat for leaders. The Incans rarely used mortar to hold the blocks together as we do to hold bricks together. Rather they were masters at shaving the large blocks down, so they would fit perfectly together. It is believed this technology was utilized due to the many earthquakes in the region, allowing the blocks to shift when an earthquake rocked the buildings. The blocks were so perfectly fit together, that even a blade of grass couldn't fit between the cracks. Machu Picchu was built during the 1400's and was abandoned nearly a century later. Since its discovery, scholars have theorized Machu Picchu was used as religious site, or possibly a place to test agriculture. 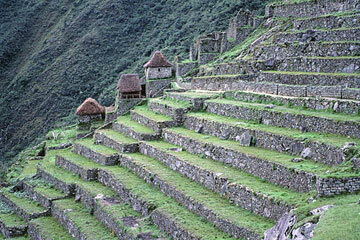 Machu Picchu has approximately 200 residences, able to house approximately 1000-1200 people. Only recently have researchers deduced it was created and used by Pachacuti, who ruled between and 1438-1472. Reasons are unclear why the city was abandoned, but researchers believe that either traveler's brought small pox, killing the Incan civilization, or the Spanish Conquests killed off the Incans. During the Spanish Conquest, the Spanish looted and destroyed many Incan civilizations. Fortunately, the Spanish did not find Machu Picchu, leaving a wealth of artifacts and knowledge about the Incan culture. In the 1980's a large portion of rock was moved at Machu Picchu, so helicopters could take people on tours to the remote location. The government of Peru has since backed out on the agreement because the helicopters could damage the integrity of the site. 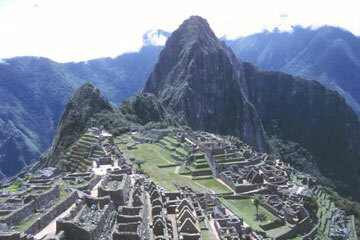 Tourism to Machu Picchu reached approximately 400,000 people a year in 2003. Tourists can hire travel guides to take them on a four day hike to the remote location.